Be predator-proof, not just from the sides, but from above and below as well. Predators that would love chicken wings for dinner include but are not limited to raccoons, foxes, wolves, coyotes and hawks. Be secure from nasty rodents (yes, rats!) that will be attracted to the feed and droppings. 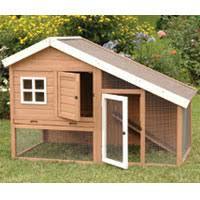 Rodents are burrowing creatures, so you need to block them from slipping into the coop from below. If you coop doesn’t have a floor, you need to bury small-mesh fencing down into the ground about 12″ all around the coop. Be breezy enough to prevent respiratory diseases, to which chickens are especially prone, but not so drafty during winter that they freeze their tushes off. Chickens can withstand the cold so long as it’s not drafty! Be easy to clean so bugs and bacteria don’t fester. Provide “roosting poles” for your girls to sleep on (2″ wide; rounded edges; allot 5-10″ of space per bird side to side and 10″ between poles if more than one is necessary; plus ladder-like grading so the pole furthest away is several inches higher than the closest). Encourage egg-laying with 1 nest box for every four or five chickens. Nest boxes should be raised off the ground at least a few inches, but lower than the lowest roosting pole. They should also be dark and “out of the way” to cater to the hen’s instinct to lay her eggs in a safe, place. Accommodate a feeder and waterer, which should hang 6-8″ off the ground. Similar to the coop, the sides of the attached chicken run, if you have one, should be buried 12″ into the soil to keep predators and rodents from digging their way in. Once again, we recommend chicken wire fencing or half-inch hardware cloth. It’s also our strong recommendation that you secure the top of the run with aviary netting or deer netting. This will keep wild birds (which can carry communicable diseases) out and provide further defense against sly predators. Come see us and pick up everything you need from waterers, bulbs, heat lamps and more. This entry was posted on Sunday, February 22nd, 2015 at 8:42 am	and is filed under articles, Chicks, News & Updates. You can follow any responses to this entry through the RSS 2.0 feed. Both comments and pings are currently closed.